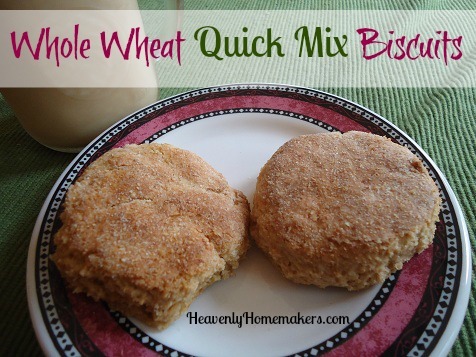 Here’s another promised Whole Wheat Quick Mix recipe! When you have the Quick Mix put together and ready to go, it is so easy to throw these biscuits into the oven. And if you want, you can make Sausage Gravy to go with them. My family cheers when I make gravy for our biscuits! Mix ingredients together, adding additional whole wheat flour if necessary to form a nice bisuit dough that will roll out well. Press or roll dough onto a well-floured surface. Cut with a biscuit cutter or round glass to shape biscuits. Place biscuits onto a baking stone or a well-buttered baking pan. Bake in a 450° oven for 10-12 minutes or until biscuits are golden brown. Have you ordered a copy of Oh, For Real: Real Food, Real Family, Real Easy yet? You’ll find all these recipes in the book – plus many more recipes and tips that will make your life easier as you work to feed your family a diet of real, whole foods! A biscuit with butter and honey sounds awfully tasty right now! My favorite way is every way! Butter, jelly, local raw honey, gravy. Yum! I want to make the quick mix soon but my organic palm shortening from TT expires on March 13th. Do you think it will still be ok to use it? I still have a quarter of a gallon left and would hate to throw it out but i’m not sure the safety after the date. I would call the company and ask them how long the product will be good after the expirationdat. I would go right ahead and use it without hesitation! Thank you! Thats what I figured sense it will be stored in the freezer after its made into the mix. I love a good biscuit any way! I think the #1 favorite has to be with sausage gravy though, yummy! Butter and honey on a biscuit is heavenly, and I do enjoy the occasional sausage gravy. I may have to surprise my hubby and make yours. I do have a question: how do these compare with your whole wheat biscuit recipe? These are a little flakier – I can’t decide which I like best, except for this recipe is easier!! Before we started eating healthy, I used Bisquick for many things. My favorite was to make it into quick cinnamon rolls! I’m going to try it with this new recipe and see how it turns out. Please let us know how these turn out and maybe share the recipe? Hello Laura. We (dc)prepared the Honey Muffins and I prepared the Fruit Pizza. I didn’t have strawberries and cream cheese so I used home-made strawberry/rhubarb jam and whip cream. YUUUUMMMM :-) !!!!! So one of my daughters and myself have celiacs disease. I love your website and enjoy reading it regularly but I am not able to use lots of the wheat recipes. This idea of the baking mix is really intriguing to me though. I just had twins and the idea of having something that I only needed to add a few ingredients too would be so very very helpful in feeding the 6 of us!! You or one of your readers have not come across a way to do this using whole grain gluten free flours by any chance? Thanks!! I know Stephanie O’Dea (the Crock Pot Lady – http://crockpot365.blogspot.com/) has a daughter with Celiac and always mentions using Pamela’s Baking Mix instead of flour. Not sure if you can get it in store, but Vitacost has it. I love this quick mix…I made the fruit pizza this morning and my family loved it! I like the quick mix because its “quick”! And with five kiddos 1-9 years I need quick! Thanks, looking forward to your book! My new favorite recipe!! As a single working mom these are the best. I love anything that I can whip up quickly for my always STARVING son. This recipe is perfection!! I made these with your sloppy joe mix for dinner last night because I was out of hamburger buns and it was great! I made these biscuits this morning and heaven help me they were so good! I had to exercise control and only eat two. I have also made the very vanilla cookies and added pecans, also a winner even with my hubby who never eats sweets. I love this baking mix and cannot wait to try other things with it. I was way too tired tonight to roll out the biscuits. I scooped them with the larger kitchen spoon onto parchment paper and kind of pushed the tops flat. They turned out fantastic! So incredibly easy! I made biscuits and got them to stay soft and fluffy in the freezer this week, using your muffin trick of sour cream. Mix butter and dry ingredients until crumbly, add sour cream and knead for 5 minutes or until a smooth slightly sticky dough forms. Roll out on floured board and cut. Freeze until ready to cook. Place frozen biscuits in oven at 375 degrees for 25-30 minutes or until done. Place fresh biscuits (not frozen) in 400 degree oven for 12-18 minutes until done. I know this is an older post. I am doing some freezer cooking in preparation for my baby due in July. I am looking to replace a freezer biscuit recipe that calls for all purpose flour. Has anyone tried freezing these just before baking? If so, how did they turn out when baked?